There are various options available when it comes to cutting your lawn, but none are as environmentally friendly as a using a reel lawn mower. Fueled by nothing more than your own two feet, these machines are lightweight yet durable and are super effective at getting the job done. Whether it’s your first time buying one, or you’re just looking for an upgrade, the following article will take you through some of the ins and outs of push reel mowers to help you make the right choice. 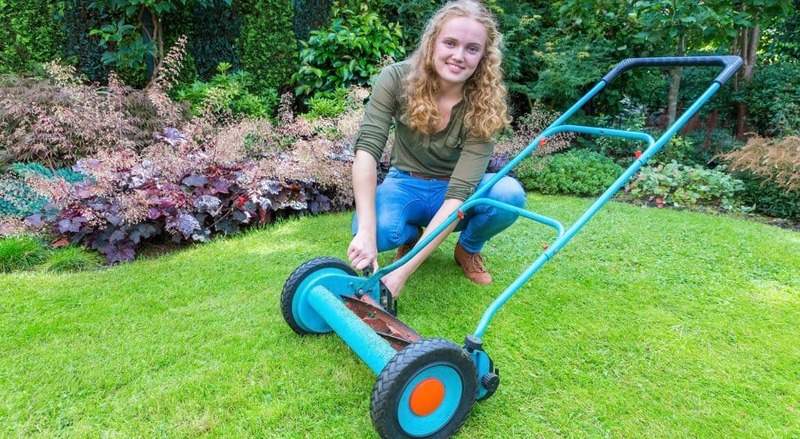 If you’re new to the world of reel lawn mowers, before you go and buy one it’s a good idea to get to know how they work. But don’t worry, as they’re nothing like today’s electric and gas-powered monsters with loads of different moving parts to worry about. Push mowers are a time-old, tried and tested method of cutting the grass, and the reason they’ve never died out is because they’re so effective. The way these mowers work is on the same principle as a pair of scissors. They have rotating blades with sharp edges that come together as the wheels turn. There’s also a back blade that’s usually fixed at the base of the rotating cylinder. As the rotating blades brush against the back blade it trims any grass or weeds trapped in between. Because these blades are interlocking, there’s no tearing or shredding of the grass. Just a healthy, clean cut. Initial cost. This is one of the best things about reel mowers. You can probably pick up a top of the range model for less than it would cost to buy any kind of power one. Ongoing cost. What ongoing cost? With a push reel mower, there’s no electric costs to consider or gas to buy to run it. All you need to power it is you. Maintenance. This isn’t too much of a concern either. Unlike power mowers, there are very few parts to push mower. And those that do make up the machine, need little more than a squirt of grease or a quick sharpen of the blades every now and then to keep them performing at their best. Quality of results. You’ll get a much cleaner cut using a reel mower opposed to a power one. The reason for this is that power mowers cut the grass by chopping and tearing it, whereas manual lawn mowers snip the grass cleanly. Grass that’s cut cleanly will heal much quicker and is less vulnerable to insect attacks and disease. Noise. When you own a power mower you have to be considerate of your neighbors and that means only cutting the grass at ‘appropriate times’. This can be extremely hard if you’re someone who works long hours or sleeps during the day. But with a push mower, the most noise you’ll be making is maybe stepping on a twig or two accidentally. In which case, you can happily mow whenever suits you. Eco-friendly. Another great benefit of reel mowers is that they’re so much more eco-friendly than their gas-guzzling, power mower cousins. They don’t emit any pollution whatsoever. So not only do you get the benefit of having great grass to look at, you get the added benefit of knowing you’re being kind to the environment. Simplicity. The fact that reel lawn mowers are so easy to use is one of the things that makes them so attractive. Pushing around a heavy power mower in the sweltering heat is not fun. Push mowers, on the other hand, are very lightweight in comparison and are much easier to maneuver across the grass. They’re also very simple machines in that there’s no priming of the engine or pulling of a starter cord to get it going. Safety. Tens of thousands of Americans are injured each and every year from lawn mowing incidents, most of which are caused by power mowers. These machines have such fast-whirling blades that have sliced off many a hand or toe. Even when the engine’s not running it can still be incredibly hot and cause burns like nobody's business. Of course, there are still risks involved with using a push reel mower, but they’re very minimal in comparison. There’s hardly any chance of you cutting off a limb, and there’s no hot engine to burn yourself on. Exercise. This may not be at the top of the list when considering why you should buy a push mower, but it is a factor to consider nonetheless. There’s no auto-drive function to help you out on a reel lawn mower, so you will no doubt work up a sweat using one. But at least when you’ve finished, not only will you have a trimmed lawn, but you’ll have toned muscles too! Number of blades. Push reel lawn mowers typically have between four and eight blades. The number of blades you need will depend on the type of grass you’re planning to mow. Just bear in mind that the more blades there are, the harder it will be to get the gears turning. Width of mower head. Most reel lawn mower’s cutting range is between 14 and 20 inches. The wider it is the more lawn you’ll be able to cover in a shorter space of time. But, the compromise is that it’s bigger and therefore heavier, meaning it will be more difficult to push. Weight. The more blades the mower has, the heavier it will be. That being said, even a decent 20-inch wide reel lawn mower shouldn’t weigh any more than around fifty pounds. Adjustability. Being able to adjust the height on your push mower is a huge benefit as not all grass is the same length. Different mowers will offer different height settings. But as long as you have around four or five different settings ranging from about one and a half to four inches or so, you should be fine. Silent cut or Contact? Reel lawn mowers come under two general categories: silent cut or contact. A silent cut mower is also known as a no-contact mower as the blades on these machines don’t make contact with the bed knife. Many people prefer this kind of push mower as they’re quieter, easier to push, and generally, provide a cleaner cut than contact mowers. Make mowing the lawn stress-free again with this fantastic reel mower on offer from Fiskars. It’s a nice looking, robust mower that comes available in either a 17 or 18-inch option. Thanks to its hardened steel blades, and built-in InertiaDrive Reel, the Fiskars StaySharp Plus Reel Mower can cut through weeds, twigs, and uneven landscapes that would have most other mowers stopping in their tracks. It’s equipped with a unique grass discharge shoot to help direct those freshly cut clippings away, and the because of its innovative design it’s also much easier to push than most other manual mowers. All-in-all, it may be a little expensive, but it’s a great performing, well-built push reel mower that’s suitable for just about any lawn, as long as it’s not too tall. Go back to your roots the quick and easy way with this easy-to-roll push mower on offer from Great States. Made with tempered alloy steel, this mower may be low-priced, but it was built to last. It’s a simple yet effective design and is one of the most precise cutting machines we’ve come across in a while. Weighing in at just 25 lbs, it’s lightweight enough to make maneuvering easy yet sturdy enough to ensure there’s no bumping or going off course on rough terrain. Essentially this means you get an end result that’s clean-cut and even. And there are 3 adjustable height settings to choose from that range between a half inch to 2 ¾ inches to make cutting the longer grass that little bit easier. If you regularly have to deal with bent or low-growing creeping grass this may be the perfect mower for you. It’s seven blade design means it much more effective than a lot of other push mowers out there. And the fact that it’s been built with a steel side plate, an alloy steel reel, and 10” durable composite wheels, you can be sure that this Earthwise push reel mower won’t be deteriorating anytime soon. You might not get a grass collector or any special features to help deal with twigs. But, on the plus side, assembly is quick, it’s completely user-friendly, and it’s pretty quiet when in motion. Sometimes it’s the simple things in life that we get the most pleasure from and that’s exactly the case with the Scotts 2000-20 20-Inch Classic Push Lawn Mower. With no fewer than nine height settings to choose from you can be sure to get the right cut for your lawn. However, please note while the the Scotts push mower is ideal for tackling grass of pretty much any consistency, it doesn’t do so well in overly long grass or areas with lots of twigs. Weighing in at 34 pounds, it may be heavier than some of its competitors, but with a wider cutting width and five heat-tempered steel blades, it’s quite an even compromise to make. It’s so easy to use and glides across most grass without any issues whatsoever. 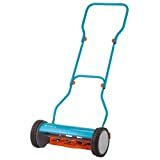 If you’re after a good-looking, quality push mower that’s durable enough to use on thick grass then be sure to check out the Gardena 4023 15-Inch Silent Push Reel Lawn Mower. It's lightweight, contact-free design means that not only is it really quiet when in use, but it’s also relatively easy to maneuver. And, that’s where the compliments end. The main problem with this push mower is the price. Considering it’s one of the highest priced push mowers available, it’s really lacking in features and a lot of the parts used aren’t the greatest of quality. Assembly is ok, but with the some of the parts being quite flimsy, it’s not ideal for anyone who’s very heavy-handed. We hope you found the above article informative and are now just about ready to make your next reel lawn mower purchase. Buying a push mower should be seen as an investment and is not a purchase that should be made lightly. Just as a recap, the best model around at the moment when it comes to manual mowers (in our opinion) is the Fiskars StaySharp Plus Reel Mower. It’s robust, it looks good, and it’s easy to adjust. Being equipped with features like a 17-inch cutting width and an innovative cutting system all the hard work is taken away from you and mowing the lawn suddenly becomes peaceful and hassle-free.